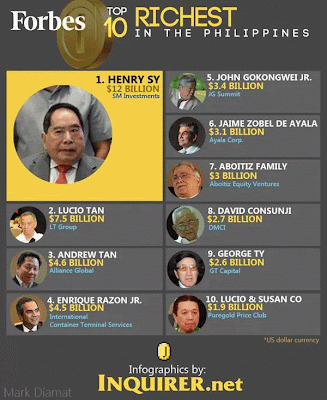 Henry Sy Sr., founder of SM Malls in the Philippines, is the richest Filipino in 2013 according to Forbes Magazine. His net worth increased by nearly $3 billion to a total of $12 billion, as shares of his company SM Investments Corp. reported record profits of over $570 million last year. Sy, who is half-Chinese, half-Filipino has been #1 on the list for the last 6 years. #2 on the list is Lucio Tan, whose net worth was estimated at about $7.5 billion. His company, LT Group Inc., handles Asia Brewery Inc., maker of popular Beer na Beer, and has a stake in Philip Morris Fortune Tobacco Corp. Inc., which has an estimated 80 percent market share of the country's cigarette market. In third place with a net worth of $4.6 billion is Andrew Tan, chairman of Alliance Global Group Inc, which runs Megaworld Corporation - one of the country's largest developers. Fourth is port terminal operator Enrique Razon ($4.5 billion); and in fifth place, John Gokongwei ($3.4 billion), who is the owner of Cebu Pacific Airlines. Ranked sixth to tenth are Jaime Zobel de Ayala ($3.1 billion), Aboitiz family ($3 billion), David Consunji ($2.7 billion), George Ty ($2.6 billion), and Lucio and Susan Co ($1.9 billion).